Crazy Lace Agate is known for it’s grounding, centering and balancing properties as well as its ability to improve mental concentration and perception, and to raise one’s consciousness. This stone of happiness promotes joy, love, emotional harmony, inner strength, longevity, and generosity. 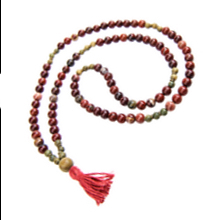 In India, sandalwood is given divine status and is thus very commonly used in mala beads. This cooling, calming and soothing sacred wood is known to promote humility and to help focus the mind for meditation.